What does the phrase ‘seasonal flowers’ mean to you? Most commercial flowers grown today are propagated in hothouses and crops are staggered to be available for extended blooming seasons. Take tulips, for example, once upon a time these beautiful cup blooms were only available in springtime and now they are only out of season in January! Seasonal flowers may not mean what you think and it doesn’t necessarily mean flowers become more expensive over winter, just that the price of blooms has flattened to be comparable in price all year round. Which is mostly good news! For our Daily Bouquets, we take advantage of all flowers grown locally at all times of the year. We do also include some imported beauties that just grow better in foreign soil, depending on the theme and composition of the bouquet. For us, seasonal flowers means recreating the feeling of the seasons where we live, using mostly the blooms that ‘should’ be available within that time of year. The design of our Seasonal Bouquets is influenced by our fondness for diversity and colour and to remind the audience that nature blooms differently in all seasons and it’s all to be appreciated and admired. 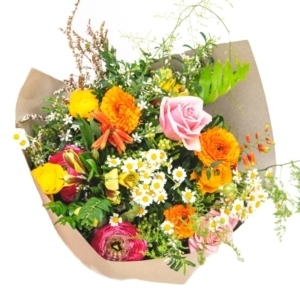 We also look forward to showcasing an additional Daily Bouquet range for special occasions, calendar events and gifting opportunities – like the ‘Good Luck Bouquet’, the ‘Get Well Bouquet’, the ‘Happy Birthday Bouquet’ and the ever-popular ‘I’m Sorry, Bouquet’. Each will be designed by experts in the fields of happiness, well-wishing and sincere apology, then hand-crafted by our team wearing big smiles!